Surgery went well and I was allowed home to sleep in my own bed on Thursday. On Friday we returned to The Royal Victoria Hospital, Belfast, for an 08:30 appointment. The dressing was removed and Elly was shown how to clean the eye four times a day and how the drops were to be inserted. On that day I saw nothing but the water level in the operated eye. By Saturday, I could see the tops of the trees. Posturing finished officially yesterday afternoon and Elly drove me to Carrickfergus for a short walk. It was wonderful to be outdoors again. At the moment I need to be careful stepping off or onto a kerb, but that will improve with each day. Eyes hidden behind my sunglasses and protected from the sun by a wide brimmed hat. The water level mark has lowered and allowed me to see more each day. Although not required, I am still posturing for an hour in the morning and afternoon. I have a return appointment to see the Consultant on 22nd September… not too long to wait. I am taking it easy with reading, so it might be a couple of weeks before I return to normal posting, reading and commenting. Enjoy the rest from my mutterings! Thanks must go to: The Medical Staff at the hospital, Elly and all those who offered help in any and every way. The good wishes, lighted candles and prayers were all much appreciated. As an aside, I took particular notice of the team who looked after me on both Thursday & Friday, the majority were ‘Guest workers’ in our country. Prime Minister David Cameron, should be ashamed of calling refuggees ‘A Swarm’, Without these… as the Germans say Gastarbeiter, our NHS – National Health Service would crumble! 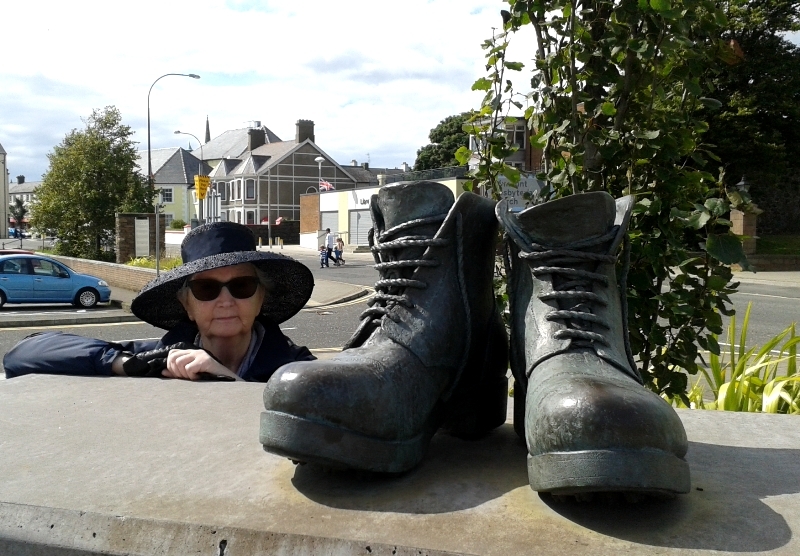 This entry was posted in Health and tagged Eye surgery, RVH Belfast, Vitrectomy on August 31, 2015 by Grannymar.